Balloch has been a village in its present form for well over a hundred years and with inhabitants since at least 1612. There has been a settlement of sorts going back to the dawn of Christianity as witness by the Fuaran a'chleirich or the Priest Spring, a fresh-water well located at Wellside after which that housing estate was named. Additionally, the Bronze Age standing stones adjacent to the A96 show historical significance in this area. Balloch was named Balleowdoch in the 1509 Charter confirmation of William Ogilvy of Strathdearn and Alison Rule granted by King James III, worth annually £3 6s 8d, with a quarter mart and a quarter mutton; with original cottages on Cherry Park thought to be 350 years old. 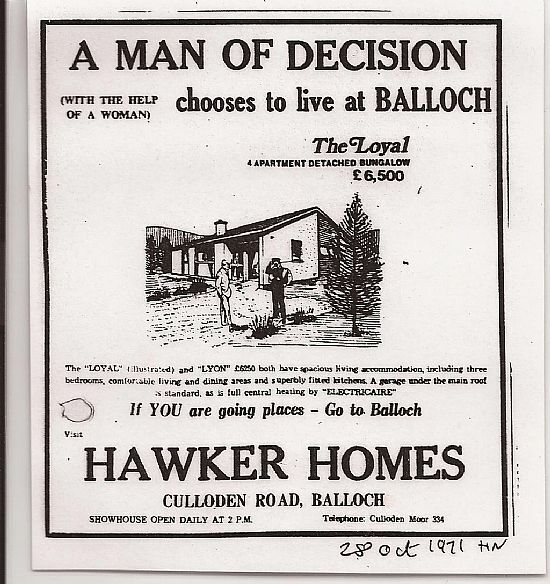 Certainly by 1846 Balloch had 20 dwellings and 104 inhabitants. So it can be seen that Balloch village has a history of some importance compared to the recent settlements of Smithton and Culloden, which are relatively recent with Culloden being largely created in the 1970s. Balloch has managed to maintain a village ethos even as it has expanded from the original village centre up the hill and with the developments to the east at Wellside. It is fortunate to be surrounded by green spaces of mainly farming land and forestry plantations, which have stopped further encroachment towards the village and helped it to retain its distinctive identity. Although the name Balloch is supposedly from the Gaelic Baile an Loch their is no evidence of there ever being a loch in the vicinity of the village and the earliest maps from 1645 show no loch nearby. Early 1970s there was a house building boom in the area because of the oil related business and the Ardersier oil rig construction site. The house builders were MacRae; Pat Munro; Wimpey; and Hawker who built much of MacLeod Road before they sold their business to Salveson Homes who went on to build Cameron Avenue. High demand meant that prices were volatile - but upwards. Prices were around £9,600 in early 1973 but within six months had risen to £12,250. 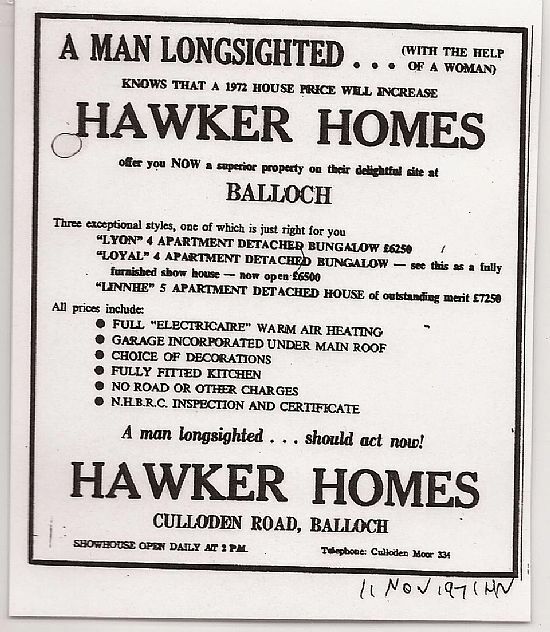 1971 - Hawker Homes building homes on MacLeod Road for £6,500. 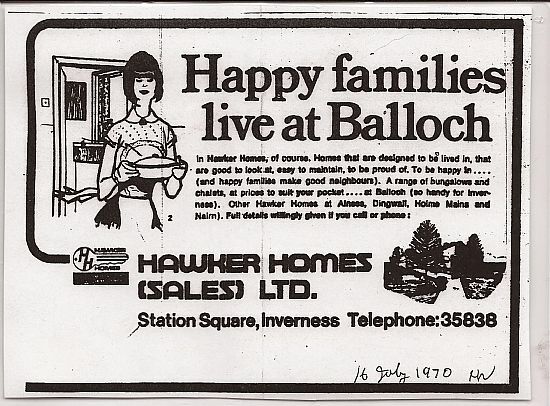 The first houses on MacLeod Road were built by Pat Munro of Alness, who then sold the development to Hawker Homes. 1972 - Culloden Road named. Other roads named and house numbers and post codes are allocated to Balloch. Previously houses were only distinguished by names. 1975 - Cameron Avenue was built by Salveson Homes. 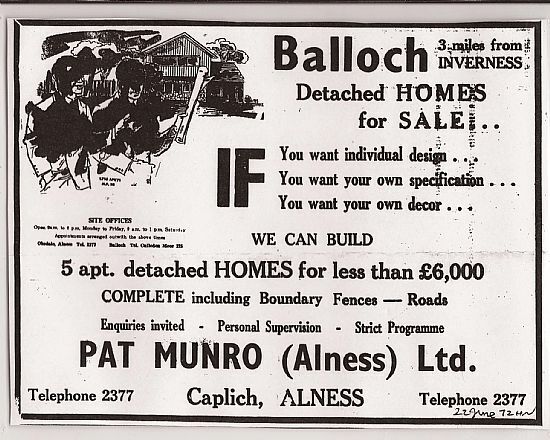 The Balloch Community Association (set up in 1971) lobbied successfully against the plan of Salveson Homes to sell the houses to Inverness District Council for use as Council houses. They engaged the support of the local Councillors - Colonel Cameron who represented Balloch to the east of Culloden Road and Archie Veitch who represented the west side. 1985 - Edgemoor Park built 'over the best bit of the birch woods.' Many older residents remember it being carpeted in blue bells in the Spring.